Who to vote for in next elections? In reality there is no one of Righteous wing persuasion to vote for. FF/FG/Labo ur are basically globalist EU lapdogs. SF/PbP/WP/DL/Independents are all Socialist who seemingly think & indeed act as if the working man is to be used exclusively for the welfare system to bleed dry under the pretext that wealth creators are all greedy philistines. What they all have in common is the destruction of the Irish Nation through mass immigration. If you think about it their has not been one debate on this subject in the Dáil or Shamad.Mass immigration & its consequences were never put to the Irish people in a referendum. The fact that nobody in the Irish mediaocre challenged this is telling in itself. It was imposed by a cadre of EU/Globalist facilitraitors. As such they usurped the will of the Irish people. Shamefully those tasked with upholding the Constitution be they senior civil servants,Army officers,senior Gardaí,Judiciary failed in their sworn duty. In Dublin Central we had the lowest turnout in the country in the last election. A 53% turnout. Remember this used to be solid FF/Bertie Aherne country. SF got in on first count. It took 11th & 12th count for FG & Ind.Gregorys Ghost to get final 2 seats with another Red coming in fourth. All leftys at best. Their was no conservative/Right wing law & order candidate so a lot of people either did not vote or spoilt ballot. As such this area is being flooded with entitled wefarers & immigrants. Middle class is being squeezed out of this unique historical area of Dublin. White flight IS happening. It is clear what was done ie mass immigration was unlawful & against the will indeed goodwill of the Irish people. 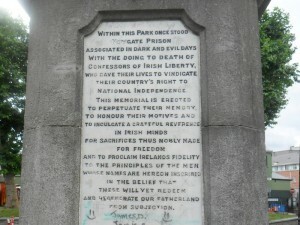 As such nobody should feel obligated to facilitate diversity,PC,multiCULTuralism etc & the entities such as Amnasty,Womens Council,Pavee Point,Immigrant Council,ENAR etc which propagate & browbeat Irish people in to accepting a concept which is alien and totally against their interests & those of their children & future generations. Parents indeed should challenge & defeat the State indoctrination of their innocent children in our schools & colleges & indeed kindergartens. Indeed it is our obligation to frustrate & harass this undemocratic PC imposition & its perpetraitors until we grow strong enough to challenge & defeat this cancer. Then we will see how weak both in body & mind PC really was/is & how its foundation was built on deceit & lies. In the meantime keep the pike in the thatch & your powder dry. It is our duty to those who have gone before us & those Irish of the future. Erin abú. Previous story NORTHSIDES DUBLIN TOURISM POTENTIAL 2.